Watermelon, arugula and feta are the classic combination, but this Watermelon Bocconcini Arugula Salad is a keeper too. 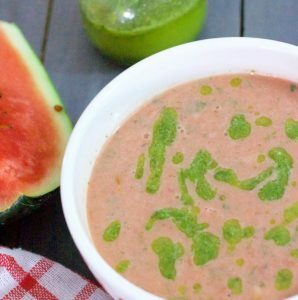 The fresh taste of the Bocconcini and the peppery arugula complement the sweet watermelon. The home made basil oil has just the right flavour to perk up the salad. Alternatively, just squeeze lemon juice and sprinkle fresh ground pepper and a little salt, to dress the salad. I add bocconcini to my salads, if they suit the other ingredients. 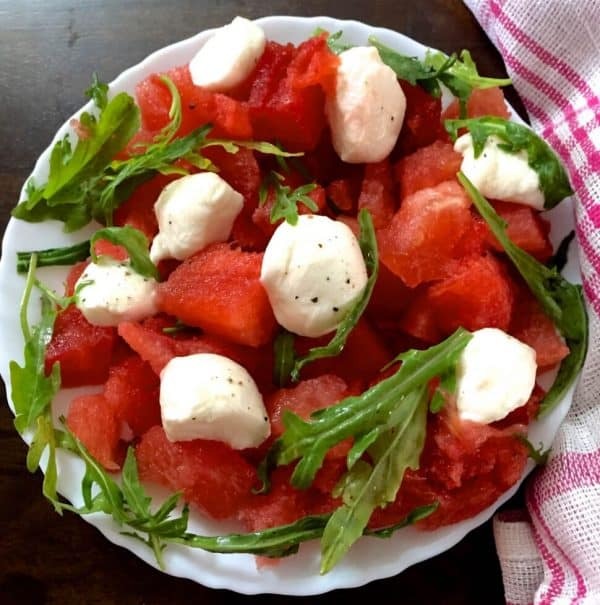 In this Watermelon Bocconcini Arugula Salad they are a perfect contrast in texture and flavour to the watermelon and the rocket (arugula leaves). 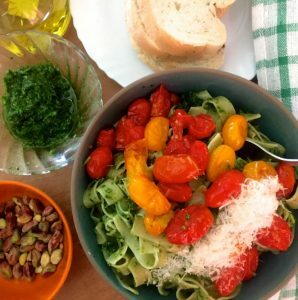 My homemade basil oil is easy to make but it can be substituted with pesto, in the salad. Wikipedia says that Bocconcini … are small mozzarella cheeses the size of an egg. Like other mozzarellas, they are semi-soft, white and rindless unripened mild cheeses which originated in Naples and were once made only from milk of water buffaloes. Nowadays they are usually made from a combination of water buffalo and cow’s milk. Bocconcini are packaged in whey or water, have a spongy texture and absorb flavours. This cheese is described by its Italian name which means small mouthfuls. It is made in the pasta filata manner by dipping curds into hot whey, and kneading, pulling and stretching. Each cheese is about the size, shape and colour of a hardboiled egg: indeed an alternative name used is Uova di bufala, or “Buffalo eggs”. Baby (“bambini”) bocconcini can also be purchased; these are a smaller version about the size of large grapes. 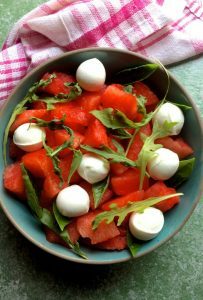 Refreshing lunch on a warm day, Watermelon Bocconcini Arugula Salad takes minutes to put together. Flavour it with homemade basil oil or with pesto. Separate the flesh from the watermelon rind, and dice it to bite size pieces. Or you could scoop up little watermelon rounds with an ice-cream scoop, to match the spheres of bocconcini. 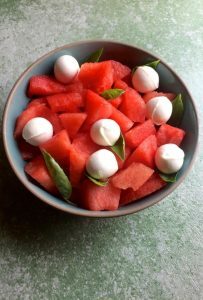 Place the watermelon pieces on each individual salad dish, add the bocconcini. Shred the arugula after removing the stalks, and add to the salad. Sprinkle salt and fresh ground pepper on each plate. Add half a tablespoon of basil oil or lemon juice to each portion, just before serving. 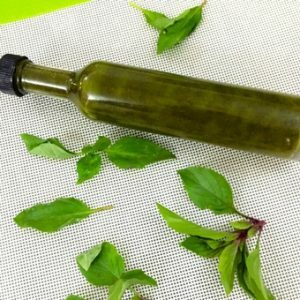 For the recipe for a very easy and flavourful Homemade Basil oil, check in the post above. Watermelon and cheese wow great combo. Delicious and healthy. I will try it whenever I get watermelon. Most heavenly combination in a salad and my personal favourite too. I would dive right into it considering how hot the weather is in Mumbai too. Loved the basil oil. Thank you Vidya! Thanks to the lovely basil in my balcony garden, I have a regular supply of basil leaves for both pesto and basil oil! So Refreshing I am going to make it soon.